If payment by bank wire is not possible, please indicate this in the remarks-field of the registration form below. In this case, you can pay in cash on arrival. The fee is given below. If a cancellation request is received before May 31st, 2013, 100 % of the amound paid minus a handling fee of 25 € will be refunded. If a cancellation request is received before July 15th, 2013, 50 % of the amound paid will be refunded. No refund will be possible after this date. Please address your request for cancellation to Ms. Andrea Kramer. The deadline for the submission of poster abstracts was on May 31st, 2013. Accepted abstracts of contributions will be available electronically via the Diffusion Fundamentals Online Journal. Posters should fit in DIN A0, portrait format (width: 84.1 cm, height: 118.9 cm). Three posters will be selected for brief oral presentations and will be awarded with a “Best Poster Award”. 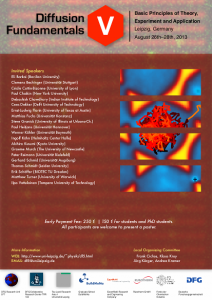 As already tradition within the Diffusion Fundamentals conference series, all contributors are welcome to submit a full length paper for publication in the Diffusion Fundamentals online journal (http://diffusion.uni-leipzig.de/). The deadline for full paper submission is November 17th, 2013. Please use the template (.tex,.doc) for submission. All submission related to the Diffusion Fundamentals V conference shall be send to the following email address.